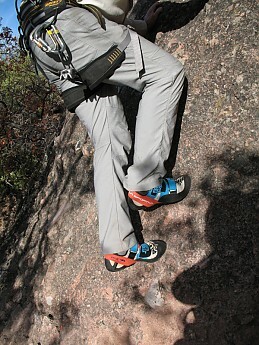 The La Sportiva Otakis climbed very well on the sandstone of Castle Rock and on the volcanic conglomerate of Pinnacles. 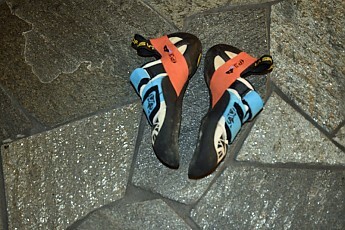 They work well for experienced rock climbers. While I did not get a chance to climb on quartzite or limestone during the review period, the bit of foot-scuffing I did on our home quartzite front entry indicated that the Otakis will also work well on quartzite. As with all technical rock shoes, you should get them fitted by a boot and shoe fitter who is well trained in the peculiarities of high tech rock shoes. 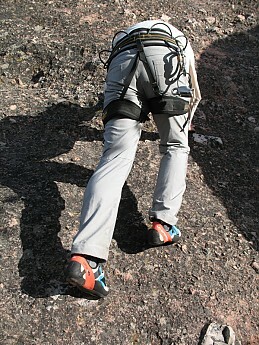 At the top of the list of gear for anyone climbing on technical routes is what you wear on your feet. In my many decades of outdoor activities, I have had footwear that ranged from miserable to wonderful. 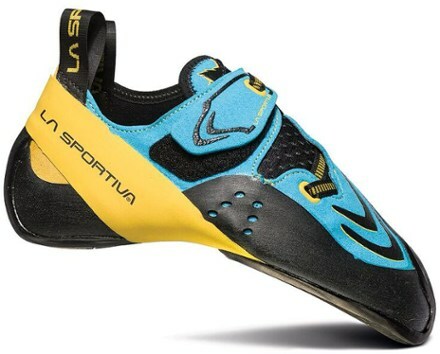 I have climbed technical rock in everything from mountaineering boots to running shoes to PAs and EBs to purpose-made rock shoes, and modern approach shoes that make provision for edging and smearing (see my review of La Sportiva’s TX4 approach shoe). Much of that footwear, like these specialized Otaki rock shoes, has been single purpose, designed for a very narrow range of activities. 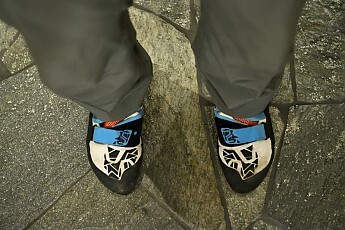 Most specialized shoes for technical rock climbing are very uncomfortable to wear on a long approach trail. So now we wear shoes designed for approach to the climb, carrying the technical shoes which we change into at the start of the technical part of the climb, then carrying the approach shoes on a carabiner along with the other technical gear. When doing extended multi-pitch climbs, we loosen the straps or shoestrings at belay stances, or even take the shoes off to rest our cramped feet. 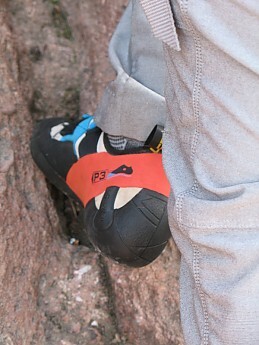 Although modern approach shoes have seen some significant improvements, enabling their use on moderately technical climbs, the higher grades and certain types of rock formations call for shoes with a significant down-turn in the sole and provisions for heel-hooking. 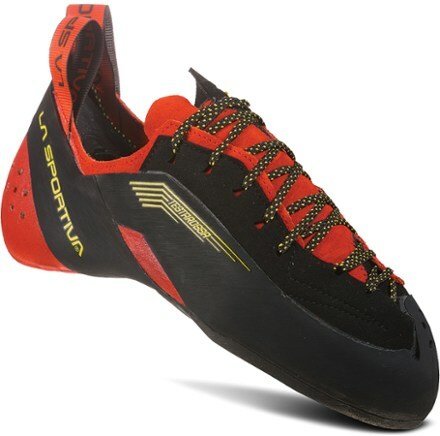 Trailspace had arranged for a pair of La Sportiva’s new Otaki shoes, Euro size 42 (US size 9). Although the box did not appear on my doorstep for several months, when the box appeared, I opened it to find the “Blue and Flame” colored shoes (that is what the description in the box says the color is). A Samurai sword on my feet??? Hmmm …. Does this forbode pain??? I had not used the high-tech shoes with the drastic down-turn shape before the Otakis. Based on comments from many friends and acquaintances who have used this type of shoe, I was dreading the extreme tightness and forced bending of the foot they described. 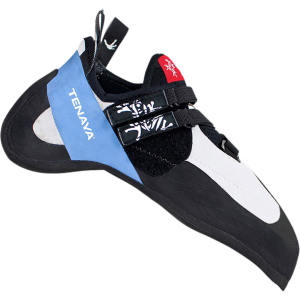 I put on a pair of Injinji toe socks, then inserted my feet into the shoes and tightened the two velcro straps across the top of the foot (unlike many rock climbers, I find that a pair of liner socks is far more comfortable than going barefoot for my rock shoes). As expected, they were very close-fitting, though the downturn was not as re-forming of my foot as I had feared (my Evolv and 5-10 rock shoes have fairly flat, stiff soles for edging). I will have to say, though, that the color scheme does not thrill me. But then, the last couple of trail running shoes I have bought now are offered only in colors that also do not thrill me. The shoe bottom of “sticky rubber” is made by Vibram (as are the soles of most of the hiking and climbing shoes and boots I own these days). I have not used the shoes enough to determine the wear rate, although I have ascended several hundred feet of various rock types in climbing areas (mostly sandstone in the Santa Cruz Mountains and volcanic conglomerate, both in hot dry weather and in cold rainy weather). Recently, a climbing partner who does much more technical climbs than I do at this stage, told me a way to keep the sticky rubber stickier after a lot of climbing smooths the soles, and that is to use a wire brush to refresh the grip of the sticky rubber (there is a technique to using the brush so you do not reduce the lifespan). This image is a side view of the Otakis on the quartzite entry to our house. During the testing, I did not get a chance to try the Otakis on quartzite, though I did use them on sandstone and volcanic conglomerate. I did some scuffing on the quartzite to get an idea of how well it would grip on that rock. The image is the Otakis with my feet in them and standing on the quartzite entry to our house. 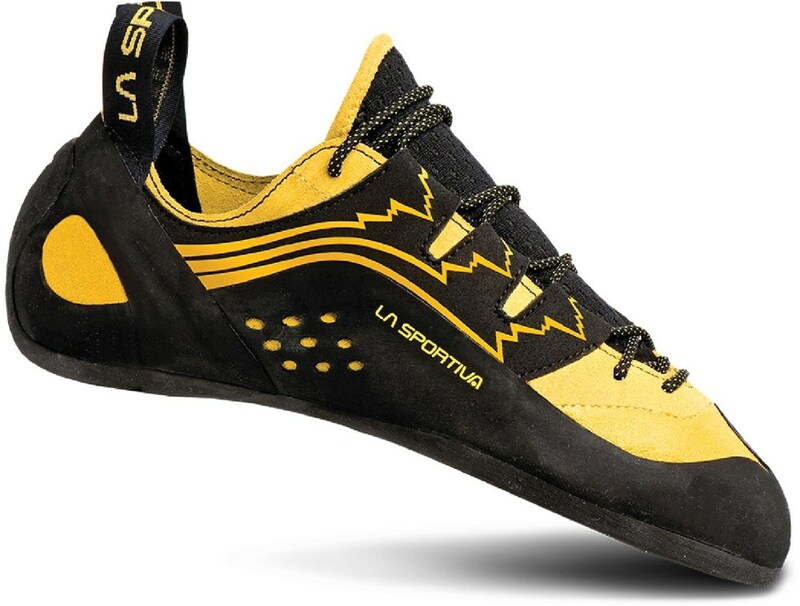 Despite my worries, the “last” that La Sportiva uses (PD 75) is close enough to my foot for comfort (the “last” is the foot-shaped block that a boot or shoe is designed and built around by the manufacturer for each size). I should not have been so worried, since I have found over the years that La Sportiva’s climbing boots, approach shoes, and ski boots fit my feet very well. Everyone’s feet are different, of course. So just because they fit me well does not mean they fit other people well. 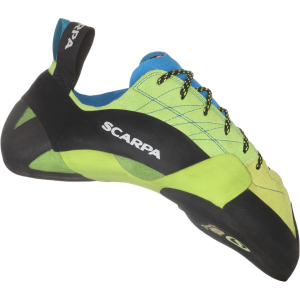 Another manufacturer that fits me well is Scarpa, another Italian brand. I did a bit of walking around the house and yard before heading for the rocks. I did find that, while the Otakis work well on the rock, they are very tight for walking for any distance. So while I wore the Otakis almost exclusively when climbing on technical routes, I used approach shoes to get to the base of the rocks, plus loosening the Velcro straps when belaying my partner at stances,. My intention was to quickly do a few climbs at a couple of local climbing areas. Here in California, we are blessed with a wide variety of rock types within a short distance. As it turned out, a large number of tasks were waiting for my attention, including several distant trips and teaching a couple of climbing instructor courses (you don’t get to climb much yourself when training other people to become instructors), along with a series of El Niño storms. Despite those demands, I managed to do a bit of bouldering and climbing on both sandstone at Castle Rock State Park and on volcanic conglomerate at Pinnacles National Park (both, well-known for producing a number of famous climbers). Castle Rock is very close to being on the San Andreas Rift. The rock there is coastal sandstone. This means that during dry spells, some sections of rock are well cemented, while others are very friable, and brushing the surface with your hand or shoe scrapes off sand particles. The climbing is mostly bouldering, and in most of the park is very enjoyable. Since coastal sandstone is even more friable when wet, El Niño precluded several weekends. Pinnacles National Park sits directly on the San Andreas Fault Rift. The rock is a volcanic conglomerate with pieces of a wide variety of minerals embedded in the solidified magma. Some of the minerals are in the form of large crystals that would provide large steps, if the crystals were not highly polished slopers and did not from time to time simply lift out in your hand, plus being located in widely spaced random patterns. 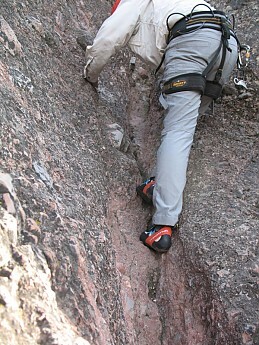 In some places the climbing requires long reaches and/or big steps if you stick to the large holds. The surface between the larger inclusions works well for smearing and the smaller inclusions provide plenty of crimps . I did get to try the Otakis in connection with the Climbing Instructor course I taught during the latter half of 2016. 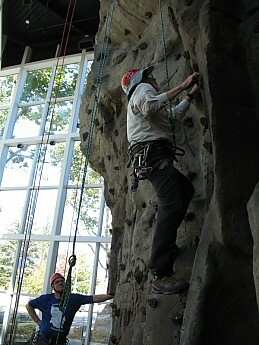 The indoor session was at the very nice climbing wall at the headquarters of the San Francisco Bay Area Boy Scout Council. I have been told that the “Rock”, as it is named, was made from a casting of a real bouldering rock. There are a number of routes that are molded into The Rock, featuring natural holds, an overhang that is passed via a jam crack or heel hook, and a chimney. 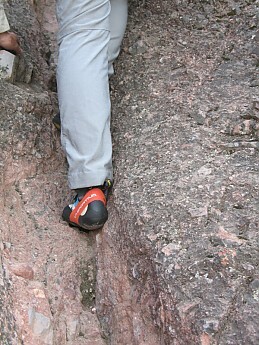 The surface of The Rock is similar to sandstone, allowing me to test the grip of the shoes. In addition, there is the usual plethora of artificial holds bolted all over The Rock. I have used this for over 15 years in training instructors and in helping troops hold introductory climbing sessions, some of which were of Boy Scout units of underprivileged youth. 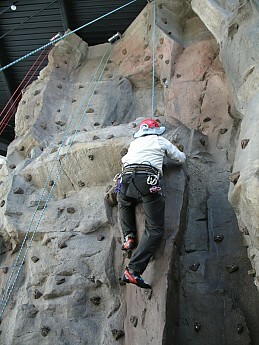 Usually, during the courses, as Climbing Director, I get little to no climbing in myself. Since the class was small, and I had only one assistant, I had to do some of the demonstrations of edging, smearing, mantling, and other techniques myself. Below are several images of me trying out the Otakis on both natural holds and artificial bolt-on holds. The next session was at Castle Rock. However, because of a series of rainstorms, we had to delay the session there. When we finally got a four-day break to get the rock completely dried, we had the Castle Rock session for the student instructors. 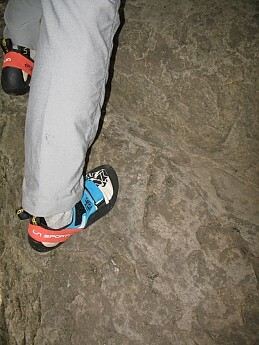 The following photo shows the shoes on one of the sloping surfaces to give an idea of the grippiness of the shoes. I was well pleased with the performance both on the volcanic conglomerate and on the sandstone at Castle Rock. The rest of the photos were taken at Pinnacles National Park. The video in Pinnacles NP, is on a formation named the Sisters, in particular on First Sister. Many of the routes in Pinnacles are run-out, as you might note in the video where I clipped the first bolt. My high point in the video is at the first chain, from which I rappelled. 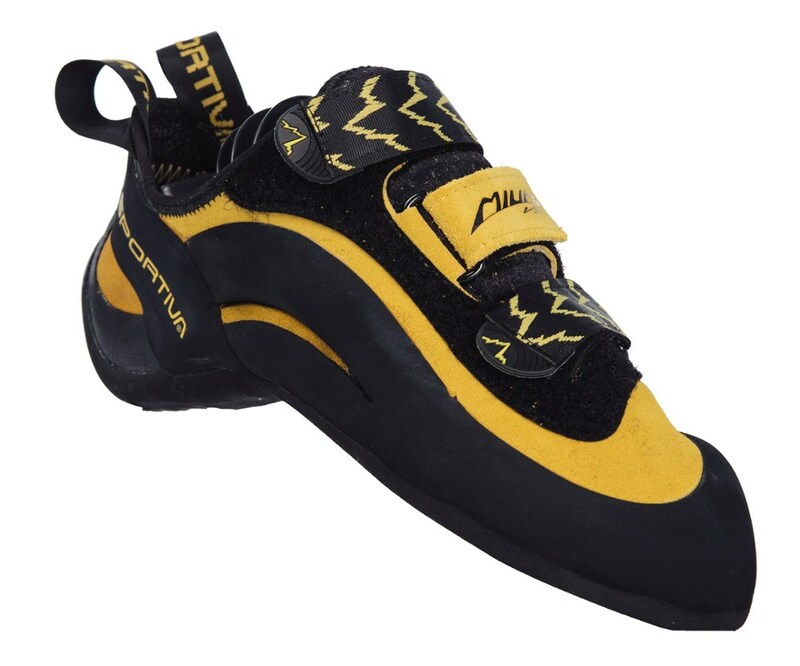 The La Sportiva Otaki shoe met all my listed expectations for a rock shoe. So I gave the shoe a full 5-star rating. However, I will remind readers that everyone’s feet differ, especially when it comes to rock shoes. In summary, the Otaki climbed very well on the sandstone of Castle Rock and on the volcanic conglomerate of Pinnacles. While I did not get a chance to climb on quartzite or limestone during the review period, the bit of foot-scuffing I did on our home quartzite front entry indicated that the grip on quartzite will work well with the Otakis..
Nice review and pictures, Bill! Thanks for testing out these rock shoes for us. 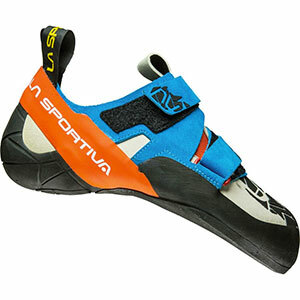 Great overall shoe for sport climbing. Nice sticky rubber really helps on slab. Shoe fits well. Definitely one of the wider Sportivas. I would recommend if you have a wider foot. Breaks in very nicely and very quickly. It does not stretch much but it molds to your foot. Super comfortable from the get-go and I can wear them for two-three routes before I have to take them off even when I first got them. Great sticky rubber makes it excellent for slab work and a stiff edge makes it great for the razor blade edges. Strong heel makes it great for hooks and the stiff toe really helps it dig into pockets. Might not be the best for sloped ledges (it slips a bit on these for some reason) though that might be personal technique. Rubber looks like it can hold up to quite a bit of abuse. Taken it outdoors a few times and they are holding up okay so far. I also use them at the gym. Great overall shoe that excels at sport (in my experience). It's great at feeling out edges and sticking to them. Definitely recommend this shoe if you are looking for something more aggressive, but not insanely so. Welcome to Trailspace, Timothy! Thanks for sharing a helpful review of your rock shoes. Do you have any pictures of yours you cold show others in your review?